Canada: The country so nice, I got citizenship twice. A little known fact about CiclaValley is that most of my family hails from the Great White North. My mom was born in Toronto and my dad’s father was part of the large Ukrainian immigration to Alberta. When I was a few months old, we moved to the GTA where we lived until I was six. There were hockey games at Maple Leaf Gardens, frozen tongues on gym bars and for some reason the word “donuts”. As mentioned in Part 1, Vancouver isn’t as much my turf, but I do have family from both parents here. ….and the fact we Angelenos have won two more Stanley Cups than the local hockey club. 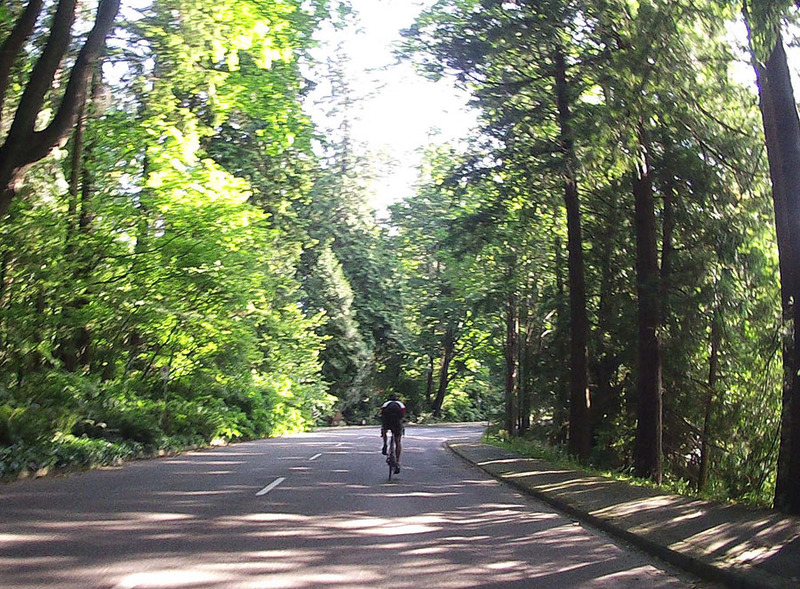 With these climbs of literally Olympic proportions lingering over the northside of the city, every cycling enthusiast would be drooling to ride them. Cypress Mountain behind the Lions Gate Bridge. Since I’m not from these parts, I wasn’t too keen on the specifics of where to go, but thanks to the power of Strava, I remembered my friend Victor had ridden here a few times and I copied his routes. 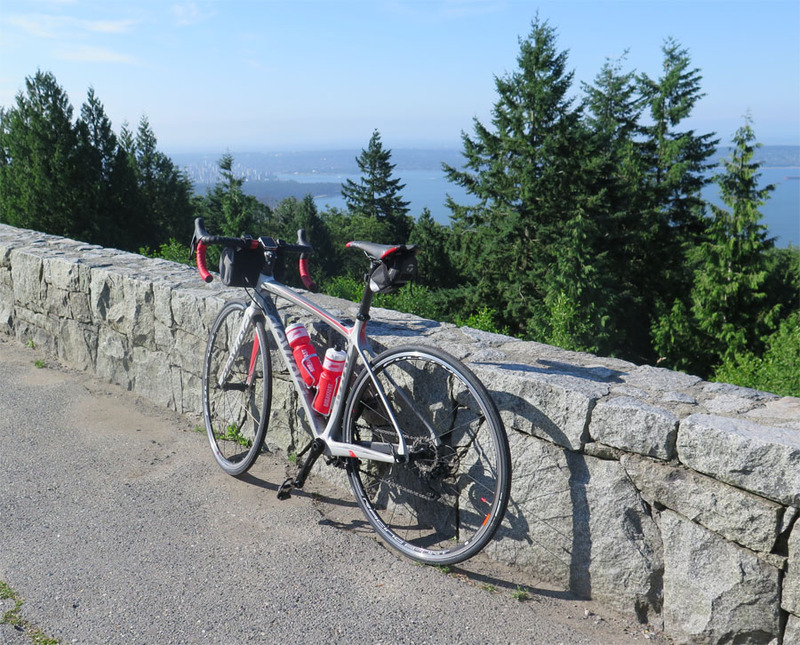 Cypress Mountain was at the top of the list, but I was unsure whether I could make that time commitment. 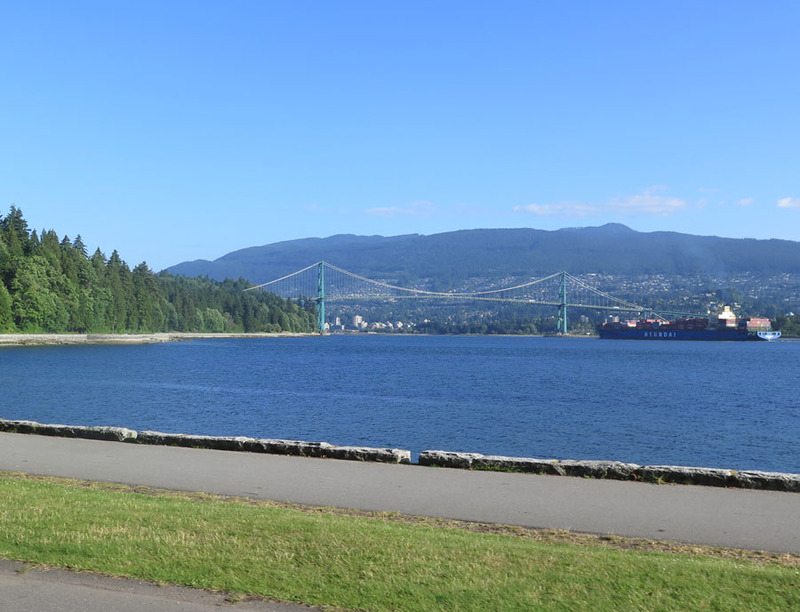 Getting there required biking through Stanley Park and over the Lions Gate Bridge which sounds considerable. When do you ever get to ride from land mass to land mass in LA? The bridge does have a dedicated bike lane on the side of the road, so making it from my hotel to across the span in 15 minutes sure seemed faster than I had imagined. 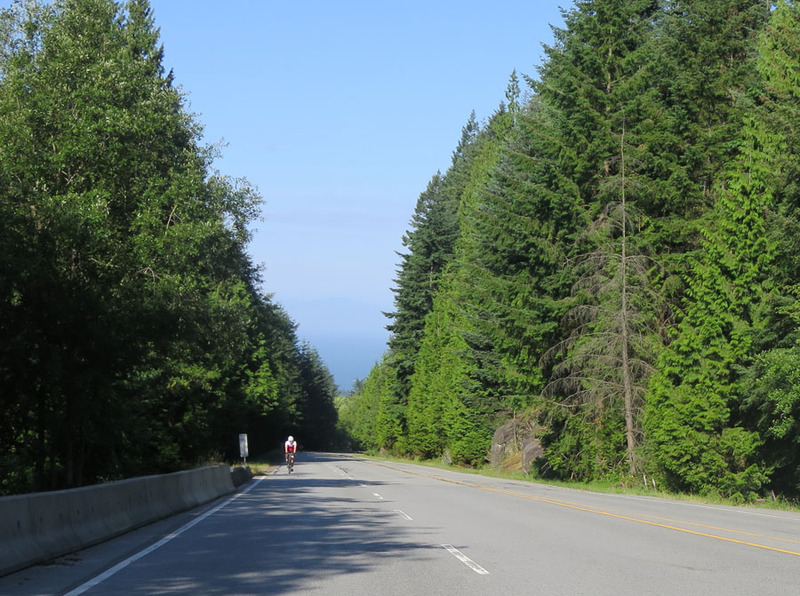 Once I made it to West Vancouver, I rode mainly major streets to make my way over, but to reach the base of the climb, Google Maps and Victor’s Strava conferred to tell me to get onto the Trans-Canada Highway. That seemed like an odd proposition to ride alongside these high speed vehicles as that’s something you don’t have in Los Angeles. Still not totally convinced this was the best choice, I decided to wait and see if there were any cyclists on the highway. That only took a few seconds. Then another person rode by. I followed this rider on the wide shoulder which also featured rumble strips on the inside to warn drivers from veering off. 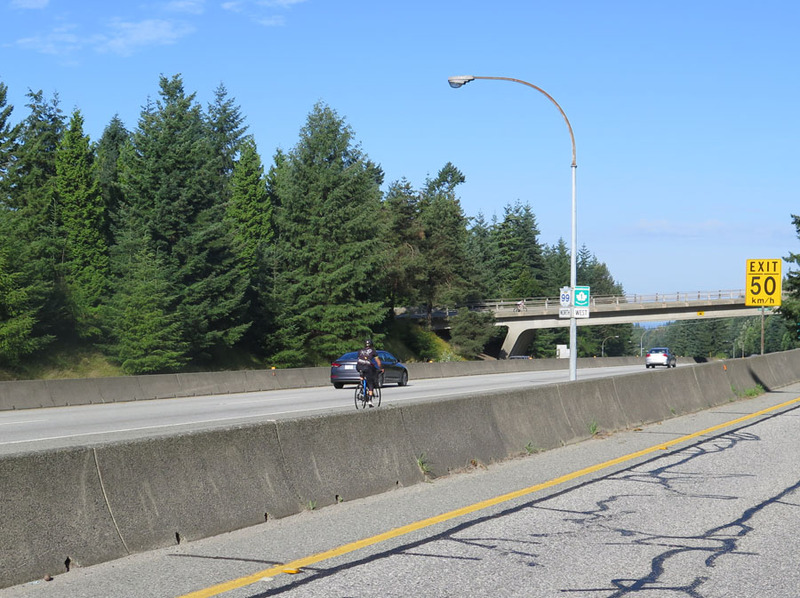 Whenever we had to cross an exit or onramp, there was plenty of signage alerting drivers to look out for cyclists. It sounds daunting, but at no time did I ever feel threatened from getting hit. 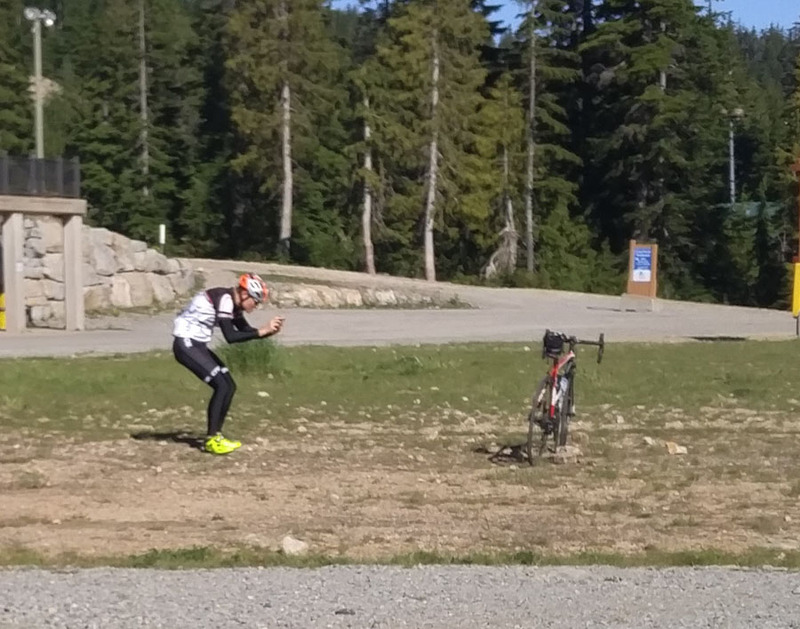 I exited for Cypress Mountain and already there were a number of cyclists up for the task. There’s a slight climb followed by a mild descent before the serious business begins. 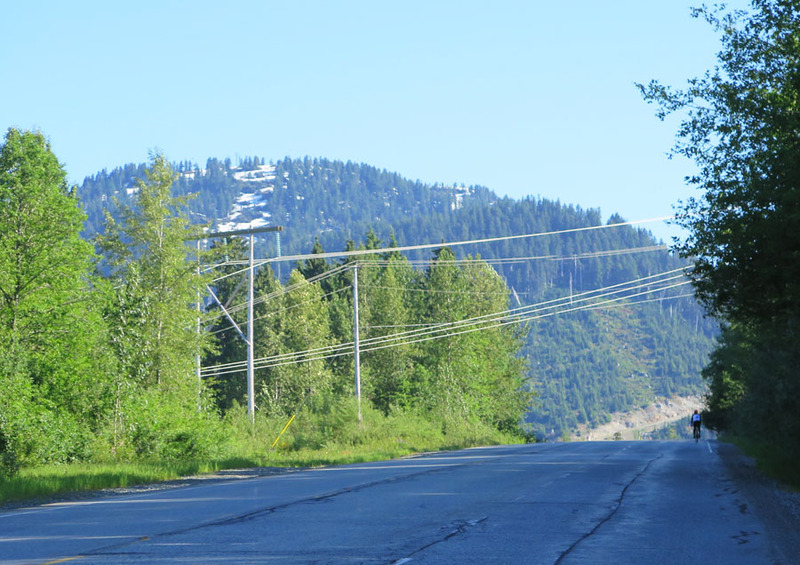 The main climb begins right after the first switchback covering 6.5 miles at 6.3% to the main powerlines. It a lot of ways, the climb reminded me of the Angeles Crest Highway up to Clear Creek. The long and unwinding road. The grade was long and consistent, and never reached a point where I was out of gears. You could just find your tempo, spin it out and keep it steady while you could focus on the scenery. 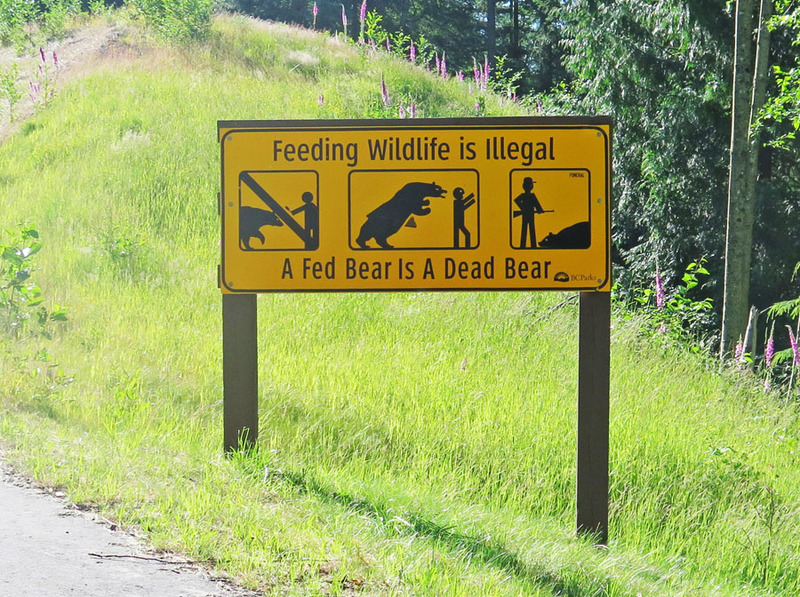 The biggest difference here is the number of trees. It’s not just that there’s more, but almost too many! Seeing where you’re going is difficult through the thickness. There are a few breaks to your right during the first part of the climb, but I’ve never really experienced this much coverage before. At the 2.5 mile mark (uggh. 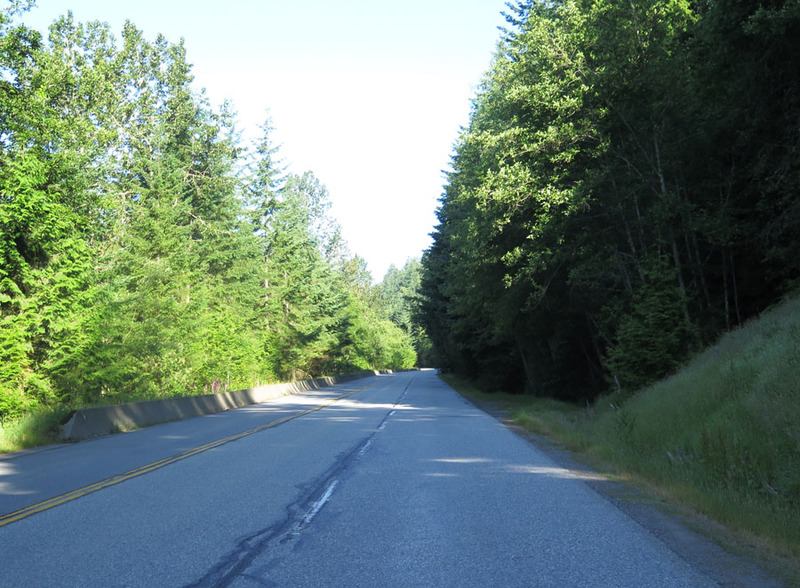 4k), there is a turnout where you’ll get your last look of Vancouver before you hit the adjacent switchback. The last look I’d get of Vancouver on the climb. On my first day of riding, I had to turn back here to make it in time from brunch, but I had to explore more, so I came back the following day. When I passed this point the next day, the ride only became noticeably colder as I climbed. I was riding with a vest that was unzipped, but as I could see from the riders coming down, I knew that would change this summer morning. The most open section until the top. What’s great about this climb is that there are two lanes going up. Whenever I heard a car approaching, I was always given plenty of space to ride. 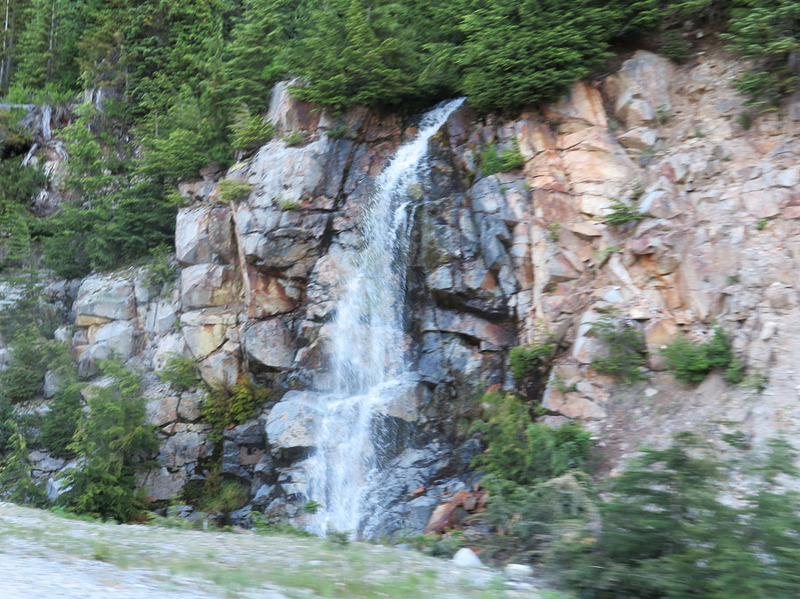 Another thing I started seeing a little more frequently as I got to the top were mountain bikers coming down. There are a number of trails carved into the hills which with all the seasonal rain makes summer the ideal time to grind them out. 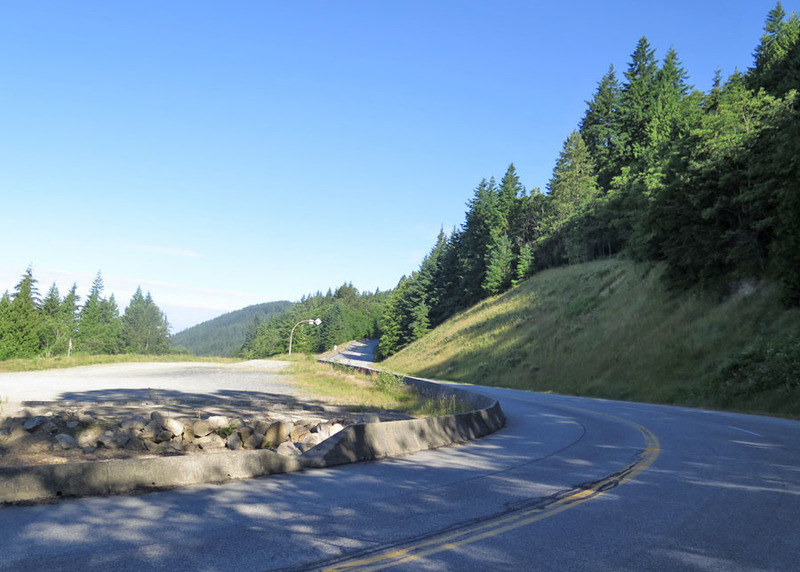 Just past the five mile point, you hit your final hairpin turn before you hit the segment summit and you’re rewarded with a little bit of a downhill. Of course, no good deed goes unpunished as you are soon countered with a double digit grade ascent for about half a kilometer. 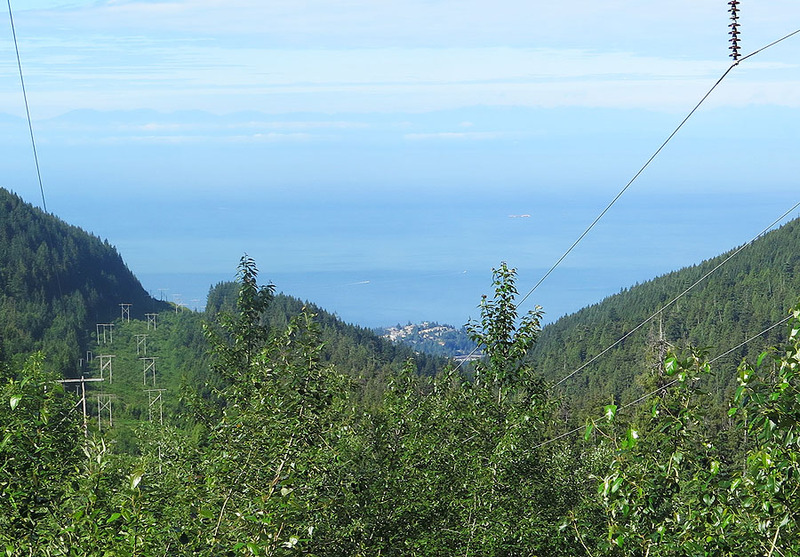 View of Horseshoe Bay from the powerlines. The pain flattens out briefly and the last half a mile (sorry about changing units) becomes a battle of perspective. You can see the powerlines straight ahead, but it’s hard to judge the distance ahead because I couldn’t make out the scale of these structures as a first timer. Besides the cuts in the tree lines, your view expands for the first time in the climb. To your left, you can see Horseshoe Bay below and around the next curve Cypress Mountain makes its first appearance. There’s almost two miles of road ahead which gratefully flattens out and takes you to the ski lodge which has water and restrooms. You get a full panoramic of the ski facilities and I could only imagine how full of energy this spot would have been for the Olympics. Overshadowed to my immediate right was a long stretch of water flowing over rocks that tenuously had trees attached to its edge. When I got to the end of the road, the ski lodge itself wasn’t open yet, but there was water and restrooms available in the structure to the south. 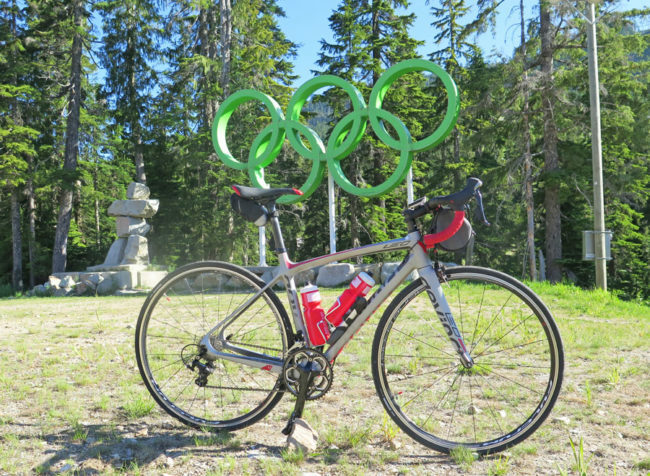 I met a couple of cyclists at the top who were also marking the occasion with ceremonial pics of our accomplishments. Even though I wasn’t really cranking it and I had already covered 8 miles, I hoped the road didn’t end. This was a fulfilling climb, but I definitely hope there are more that the mountains offer.